Remembrance Day is edging ever closer, and this year is set to be a major national event, as Britain prepares to commemorate a century since the end of the WW1. This year has seen a rise in awareness of the diverse range of nationalities, ethnicities and faiths of who fought and sacrificed on behalf of Britain. The commonwealth contribution has been a key feature of the RBL’s flagship ‘Thank You’ campaign, and numerous communities have been engaging on a local level; with seminars, events and initiatives designed to ensure that all those who served are honoured this centenary year. Many in the Somali community have been involved in this drive to improve public understanding of the role of ethnic minority groups WW1. This includes the establishment of a new exhibition, Somalis in WW1, which uses interviews, photos and objects to document how Somalia was touched and changed by the conflict. Created by the Somali Advice and Forum of Information (SAAFI) community organisation in partnership with Brent Museum and Archives, the exhibition offers visitors the chance to gain insight into the lives of those who served on the front line. Yusuf Dualeh Amarreh, the grandfather of famous health care pioneer Dr Edna Adan, is one of the Somali soldiers honoured in the exhibit. SAAFI Director Mrs Rhoda Ibrahim’s father also fought in the conflict, and features in the exhibition in the form of an Empire-era Somali-British stamp designed to commemorate the end of the war. In this way, and through his tall, proud and fearless pose, Ibrahim played a major role in influencing perceptions of the Somali askari (soldier). The portraits and medals of these and other Somalis are displayed proudly; symbols of dedication, bravery and, perhaps most importantly, solidarity. 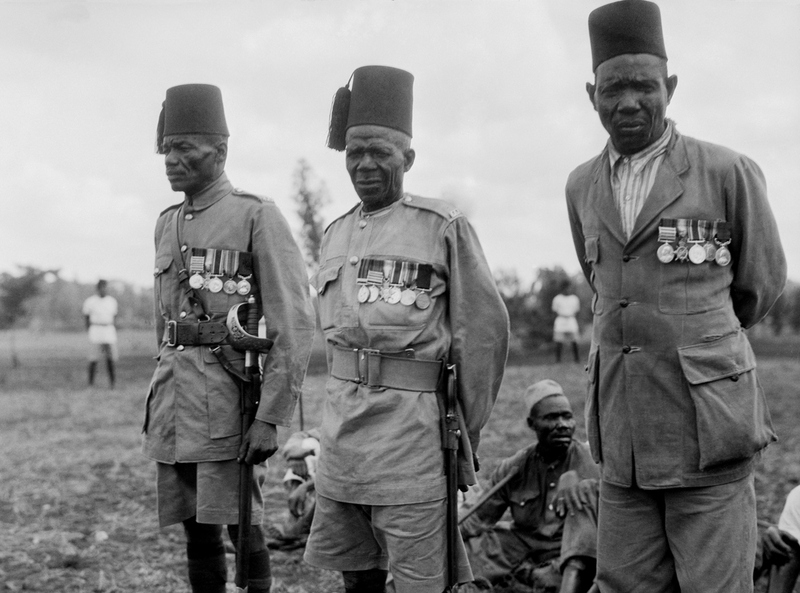 Some were deployed to Europe, whilst others served in the Somali Camel Corps and the Kings Africa Rifles. That’s to say nothing of the wider sacrifice made by the citizens of Somaliland, offering not only manpower, but also resources and infrastructure, in service of the British military effort. The hitherto neglected history of Somalis and the First World War is fascinating; a microcosm of a wider narrative of shared history which is beginning to take root amongst the general public. That’s thanks to the volunteers like those of SAAFI. Their commitment to telling the stories of their forefathers is enabling others to learn about the conflict through fresh eyes. By framing the war in global, multi-national and multi-ethnic terms, exhibitions like Somalis in WW1 acknowledge the deep emotional roots that produced multi-culturalism in the 20th century, as well as maintaining and strengthening the diversity of modern Britain. You can learn more by attending Black and Afro-Caribbean contributions to WW1 at the Brent Museum and archives on Thursday 8th of November, 6:30-8:00pm. Entry is Free and no booking is required.